Tonkichi とん吉 @Shaw House (Singapore) | Get Your Grub On! Cabbage and fried pork is all I need. A friend and I were catching a movie tonight and wanted to check out ‘Tonkichi’ for dinner beforehand. 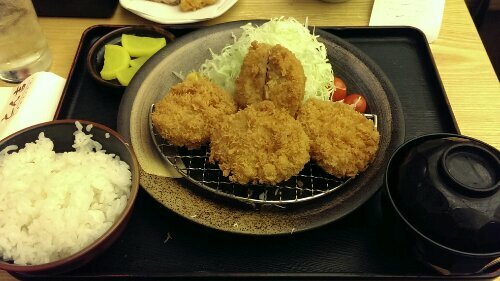 I ordered the ‘Minced Katsu‘ as appetiser and the ‘Loin Katsu‘ as main. The little fried minced katsu pieces were pretty greasy but quite tasteful at the same time. The batter on the loin was also more oily than I would have preferred but the pork was juicy and soft. Great stuff, just wished it wasn’t dripping of oil so much. I loved the accompanying cabbage, delicious and crunchy with a light soy based dressing. I pretty much liked the food down here, service had some smaller hiccups but besides that was fast and kind. The place itself was less impressive, simple setup and felt busy and loud when packed but I probably will still come back here if I allow myself to some fried stuff again.